Poinsettias aren't the only flowers to decorate with at Christmas. Don't forget hibiscus, plumeria, orchids, and bird of paradise flowers. Flowers for your Christmas tree? Yes! 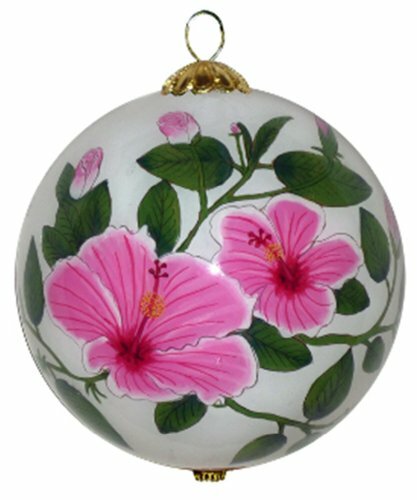 Tropical Flower Christmas Ornaments make a beautiful addition to your tree. Colorful tropical decorations are just the right touch if you live in a warm climate, or even if you want to bring the warmth of the tropics into your home during a cold northern winter. Poinsettias are ever popular for Christmas, but why stop with one type? 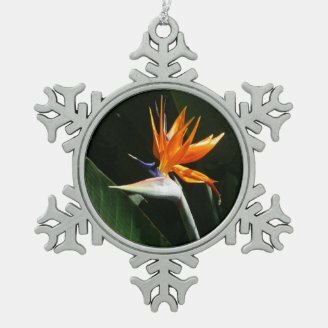 There are also beautiful ornaments to be found with hibiscus flowers, bird of paradise blooms, plumeria blossoms, and even a few orchids. Think about it! Dream of the tropics as you browse the lovely blossoms on this page that you'll love using this coming holiday season. 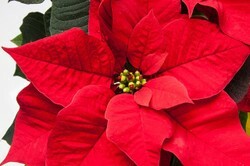 Probably the most popular flower at Christmastime is the beautiful red poinsettia. While red is most often see, they also come in other colors, including white, yellow. and pink. Poinsettias are native to Mexico and Central America, although they grow well in other tropical and sub tropical climates. Potted poinsettias are found everywhere during the yule season. They're used as table centerpieces, placed in entryways, and given as gifts. 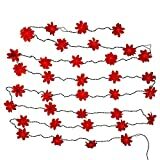 But, you can also light up the branches of your tree with these beautiful star shaped blooms. There are several styles of poinsettia string lights available, including a 35 light set from Kurt Adler, There's also a smaller battery operated set, adorned with gold glitter, that can be used either on a tree, or in a window. Sometime in the 1500's, the little girl wanted to honor the Christ child with a gift. But, she was very poor, and was sad at heart, as she had nothing to give. An angel appeared to her, telling her to pick some weeds by the side of a certain road. She was to hold the weeds close to her heart as she carried them to the church. The little girl did just as the angel ha said. She entered the church, holding her little bundle of weeds held close as close as she she could without crushig them. As she placed her bouquet lovingly at the alter, the miracle happened. The scraggly weeds miraculously blossomed with beautiful red flowers star shaped flowers, representing the Star of Bethlehem. And that's how poinsettias came to be. 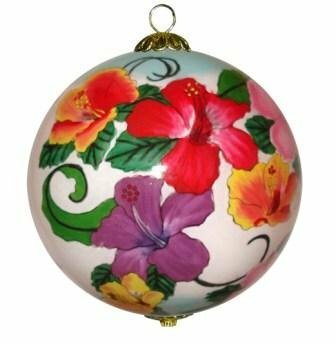 A wonderful tropical flower ornament or two will add a colorful bit of warmth and beauty to your holiday decor. Tropical flowers really aren't "out of season" for Christmas - after all, it's Christmas in the tropics, too - not just in the snowy north! So, when you think of Christmas flowers, think beyond the traditional Poinsettia! There are over 25,000 different species of orchids. These exotic flowers come in more varieties than any other flower family, except the daisy. But, did you know that there's one species that's actually called the Christmas Orchid? There is! It's the one shown in the picture just above. The name of the species is Cattleya trianae. Named for a 19th century Colombian botanist, José Jerónimo Triana, they grow in cloud forests of that country. This endangered species is Colombia's national flower. Two other countries that border the Caribbean Sea also have named blossoms from the orchid family as their national flower. Venezuela's is the Easter Orchid (Cattleya mossiae). and Costa Rica has designated the species Guarianthe skinneri as theirs. Some families have a tradition of obuying one special ornament each year. The collection that results from these annual purchases is lovingly passed down to the next generation, and they become real family treasures. This particular ornament is certainly a candidate for that annual tradition. 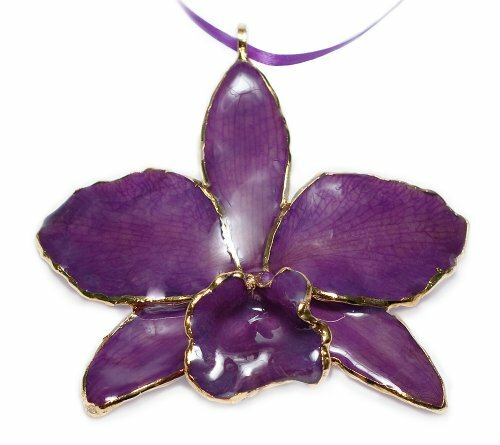 It's an actual preserved orchid blossom - enameled and gold edged. What a beauty it is! 1 - Colors of hibiscus include white, yellow, pink, orange, red. and purple. Scientists in Texas developed a blue variety in 2010. 2 - The hibiscus flower is sometimes called the "Rose of Sharon," which symbolizes beauty and faithfulness. 3 - A more traditional meaning assigned to the flower is "delicate beauty." 4 - Many hibiscus species are like chameleons in that they change colors. Most changes are with the season or temperature. However, th Hibiscus mutabilis (common name: Confederate Rose) changes color with the time of day. In the morning, it's white, and turns pink by midday. By evening, it has become red. 5 - Recent studies have indicated that drinking hibiscus tea may help to lower blood pressure. 6 - It is Haiti's national flower, and the state flower of Hawaii. 7 - If you visit Hawaii or the Fiji Islands, and see a lady with a hibiscus in her hair, pay close attention to where she wears it. If it's behind her right ear, she's single. Worn on the left side, she's married or in a committed relationship. If there's a flower behind each ear, she's with someone, but might like to be with another instead. Aloha! Get in the spirit of Christmas - the smiling spirit of Hawaii, that is. 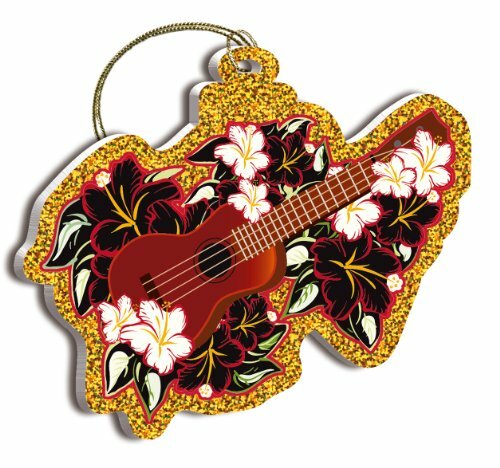 Tropical flowers and island music music come to mind when you look at this little hanging ornament by Pacific Island Art. A ukulele surrounded by dark red and bright white hibiscus blooms is sure to put you in the island mood for the holidays. The edge is done in reflective gold foil to add a little hula sparkle when you turn on your tree lights. The unusual shape of the bloom of the exotic Bird of Paradise plant resembles a flying bird. This may be where it got its name. The more common variety is orange and purple, though there is also a lovely versiou where the orange is replaced with yellow. These plants, which like warm, sunny climates are often thought of as the ultimate tropical. They are actually natives of South Africa, though they are now widely grown in other warm climates, especially the Caribbean, Florida, and Southern California. Because of their bird in flight appearance, they are thought of as symbolizing liberty. It's just amazing to think of the skill and patience that it must take to paint the flowers on this ornament. It's done by hand - on the inside of the globe! This beauty is a real Christmas keepsake that will look exuisite when on display. You'll also be proud to pass it on to another generation when the time comes. It comes in a protective gift box. Did you ever wonder what kind of flowers Hawaiians use to make leis? Very often, it's the Plumeria, or Frangipani blossoms that are used. The two names refer to the same blooming tree. The plumeria is a flowering tree native to tropical climates. A relative of the oleander, they come in a host of colors. The blossoms range from whites through pinks and yellows, to lavendar and reds, both bright and deep. Interestingly, their fragrance is more robust at night. This attracts nocturnal moths, and instigates pollination, though the moths are not rewarded with nectar. Plumeria don't produce any. 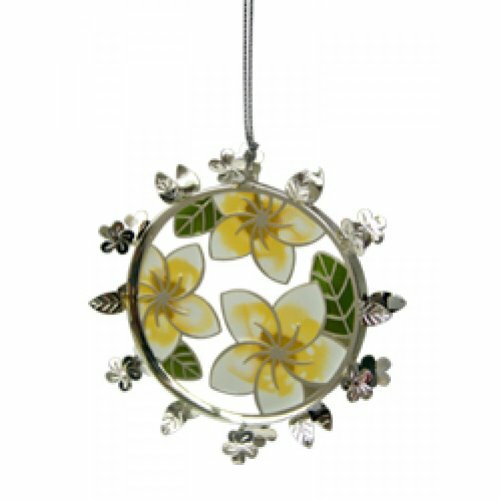 The first is a wreath shaped piece, with three pale yellow flowers in the middle.. Though it's made of metal, it's a very light weight one. Like the flower itself, it's small (about 2.5 " in diameter) but pretty. Second is a hand blown ornament that does justice to the real thing. After hand painting it, the artist added just enough glitter to give it a bit of a spakle. 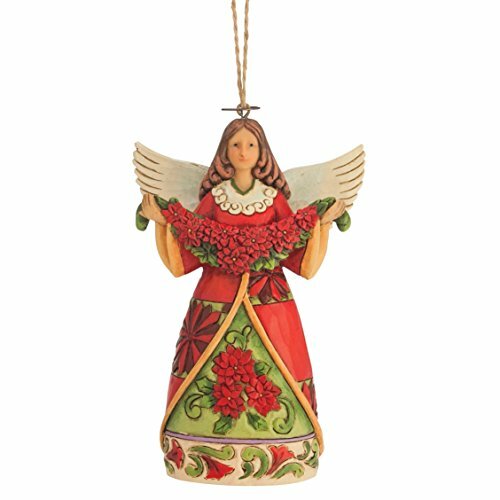 At about 3" x 4", it's a good size for just about any branch of your tree. It comes in its own box, which can be used to safely store it in from year to year, or that makes it ideal for gift giving. If you like the warmth of the tropics, add a whimsical tropical touch to your Christmas decor with pink flamingo ornaments, cards, gift wrap, and Christmas yard flamingos. If you'd like to make some flower ornaments for your tree, or as part of a wreath, centerpiece, or other decorative project, here's a how-to video that will help. Which Tropical Flowers Would You Like on Your Treee? A mix of all of them! I'd like for my tree to bloom with all kinds of tropical flowers. 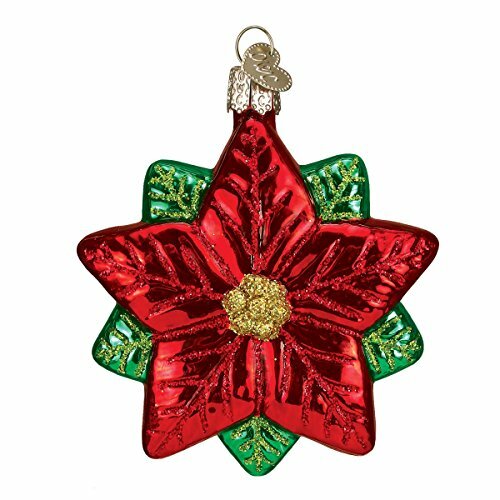 Do you thin flowers are a good idea for holiday tree ornaments? They are so pretty! After all, there are many flowering trees - the magnolia, the golden rain tree, and others. So, why not a flowering Christmas tree? 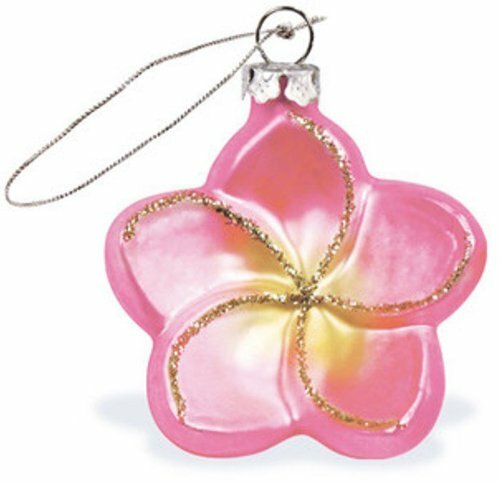 CruiseReady, The actual preserved orchid blossom ornament is lovely. After reading your article, I see that a tree with Christmas flower-themed ornaments is a joy to build one decoration or more at a time and hopefully pass on. Yes, I think it tends to get too cold many years from about Daytona and up. They do pretty well here, but not in North Florida. Thanks for the reply. I think that most of Florida gets too cold for them to survive there. Dustytoes - we used to have a bird of paradise in the yard, but not any more. There are several nice Hawaiian ones available, blackspanielgallery. Do you have a bird-of-paradise growing in your yard? I like the Hawaiian one. Birds live in trees, so add a few to your Christmas tree this year. For a warm and colorful feel, tropical birds, like parrots, toucans, and flamingos are sure to please!